Courtyard Cottage01263 715779work01603 870304fax Self-cateringFormerly a traditional flint and brick barn, this property has been lovingly converted and now provides modern utilities, comfortable furnishings and a charming aesthetic. This property is perfect for couples looking for a romantic stay in the lovely Norfolk countryside. Only a short distance away are a number of rural walks with scenic views and some fantastic pubs and great restaurants. Exterior view of Courtyard Cottage, a small brick and flint barn. 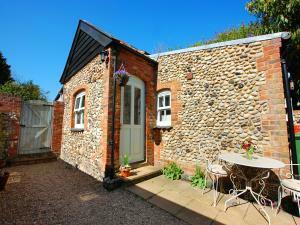 Courtyard Cottage offers weekly bookings starting on Friday. Formerly a traditional flint and brick barn, this property has been lovingly converted and now provides modern utilities, comfortable furnishings and a charming aesthetic. This property is perfect for couples looking for a romantic stay in the lovely Norfolk countryside. Only a short distance away are a number of rural walks with scenic views and some fantastic pubs and great restaurants.